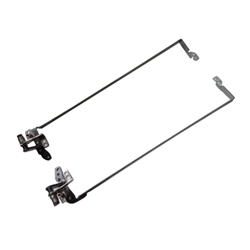 Description: New genuine Acer laptop replacement hinge set. This set includes the right and the left hinge & bracket. There is more than one set of hinges that go to the models below so please check the pictures and the part #'s carefully. This set is for a laptop that came with a regular LED screen. If your laptop came with a slim LED screen these are not the correct hinges. If you have any questions let us know. Part #'s: 33.R0107.002, 33.R0107.001, FBZR7C309010, FBZR7C38010. Acer Aspire 5745, 5745G, 5745PG.